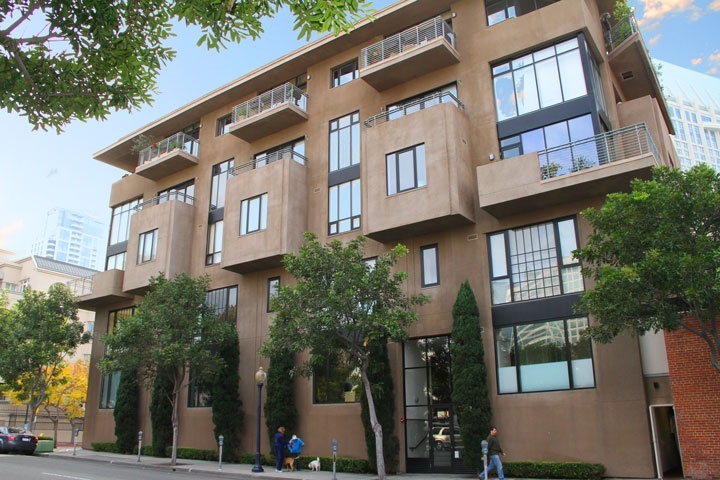 The Brickyard condos are located at 611 West G and 601 India Street in San Diego. If you are looking for a condo in the downtown Marina District of San Diego then Brickyard maybe the place for you. Homeowners association dues run $421/month for a prime location and rarely come on the market. The brickyard is a five story building with only 18 units and designed by well known Architect Jonathan Segal, with a sophisticated and contemporary flair. The Brickyard condos range from one to 3 bedrooms with select condos offer breathtaking panoramic cityscape & park views. One of the unique features of The brickyard condos are the floor-to-ceiling windows and 9 foot ceilings and underground parking. Great location across the street from Pantoja Park with local restaurants, shopping. Below are the current The Brickyard downtown San Diego condos for sale. If you are looking for a downtown San Diego condo for rent please visit our San Diego rentals page. We also provide all sold The Brickyard condo sales at our San Diego Sold Search. All The Brickyard condos for sale are also listed below. Questions? Let our team of San Diego Realtor Associates help you. Please contact us at 1-888-990-7111 today.